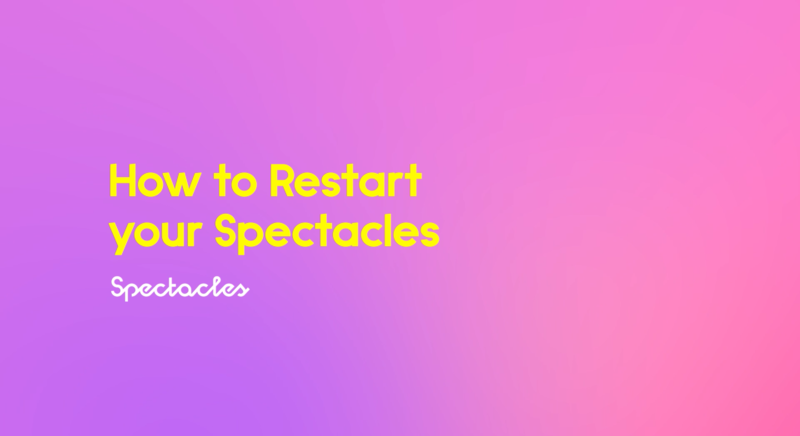 If you’re experiencing issues with importing Snaps, charging your Spectacles, or are running into an error, try giving your Spectacles a Power Cycle! It won’t delete any Snaps or unpair your Spectacles, so it’s no sweat. Press and hold the button on your Spectacles for 20 seconds. Release the button on the 20 second mark. You should see all LEDs flash once. Note: Try not to hold the button for more than 20 seconds total. If the LEDs didn’t flash, please wait ten seconds before retrying. Pressing the button too quickly may Hard Reset your Spectacles. Swipe up to Memories and tap on the Spectacles icon on the top-right corner. Tap on your Spectacles under the ‘MY SPECTACLES’ section. Tap ‘Restart Spectacles’ under the ‘ACTIONS’ section. Keep in mind that our first-generation Spectacles (Black, Coral, Teal) have a different Power Cycle process than the one mentioned above. To learn how to Power Cycle those, go here! Try charging your Spectacles for at least 20 minutes before retrying a Power Cycle.